Our women's ministry for church was doing a fund raiser for our mission trips that are coming up this year. I waffled back and forth on whether I wanted to go or not. On one hand, I wanted to hang out with a bunch of ladies. On the other hand, it was $40. On the one hand, it was for missions (of which I'll be doing one). On the other hand, did I really want to paint? Decisions, decisions. Obviously I decided to go or this post probably wouldn't exist. 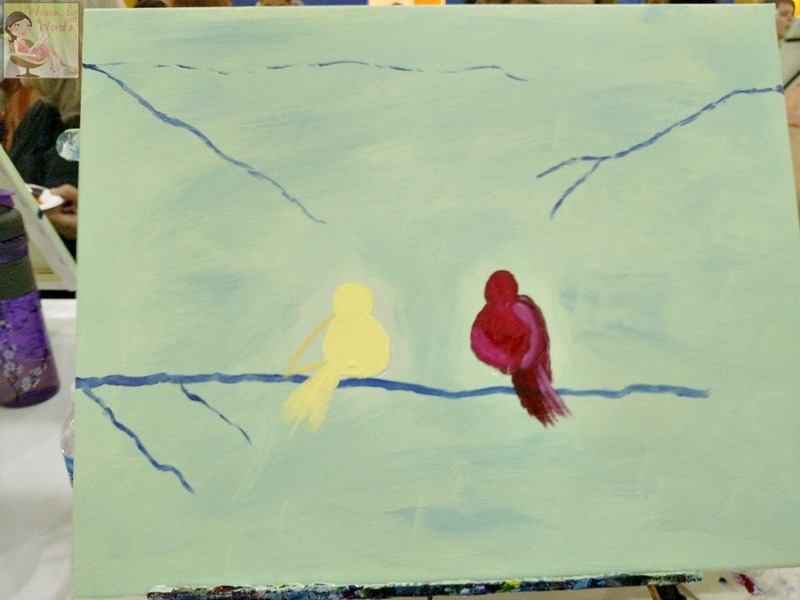 The thing that put me over the edge of deciding to go was that they were painting a male and female cardinal. Cardinals are my favorite bird. How could I say, "no"? I wasn't sure I was going to know anyone at the event. I showed up just to paint. Then familiar faces started showing up, and I was thrilled. I sat near one of the young adults, and then across from me one of the gals from a Bible study we just joined. She kept cracking me up throughout the whole night. One of the ladies to the right of me was on our mission team last year. I met a lady named Regina, and she was delightful to paint next to. Let's get down to the business of painting. So, we started off with a blank canvas. Novel, eh? The instructor had everything set up when we got there. She also had 2 assistants. We began by mixing our first color to make the background color. We then determined where our cardinals would be. After our BB8s, er cardinal bodies were, then we painted the background. I haven't painted since high school, and my mom used to go on and on and on about how great I was at art. I kid you not, she probably STILL has a cougar picture I made in high school on her work wall. I knew I wasn't going to do such a great job, but once I had the cardinal bodies circled, I realized it was probably going to be worse than I thought. 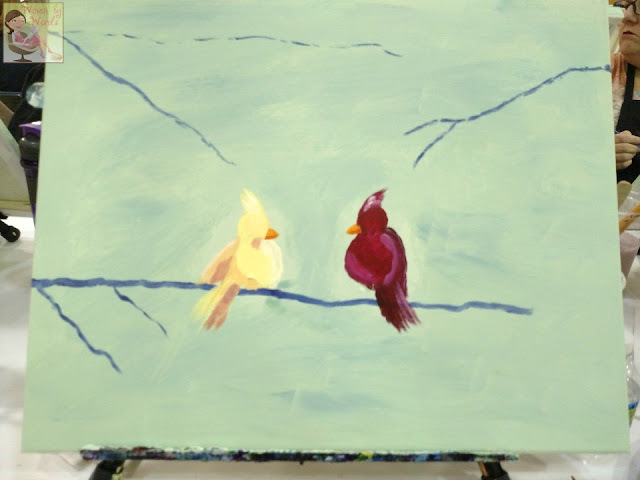 lol My birds weren't as big as I had hoped, but c'est la vie. Nothing I could do about it at this point. 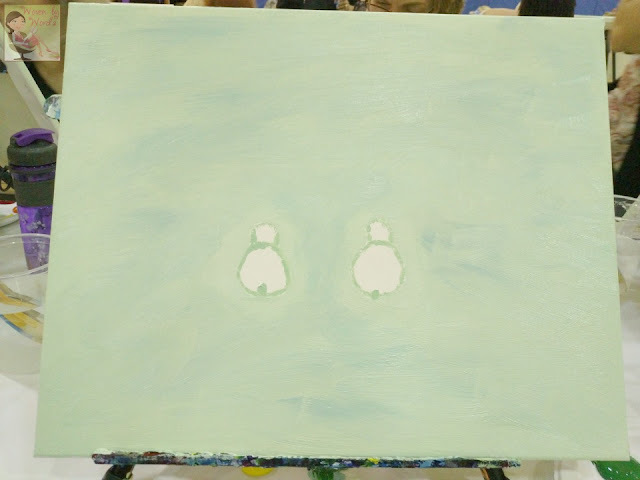 I have NO idea how this is going to look like the original painting that's supposed to be our example. Needless to say, the entire process had several of us in stitches. Jessi was sitting across from me, and her faces kept cracking me up. So, when it came to blending the colors...first, I ran out of space on my paper plate. lol I had a hard time blending colors. The instructor was doing a good job. I was just really critical of the colors. hahahaha Of course, I also think literally. Her female cardinal was very yellow. Female cardinals are more of a flesh/cream color. I wanted to follow the instructions, but my brain convinced my hands to go a lot lighter. Hey, they were supposed to be "our" conception of the painting, right? lol I was making it mine. This is the finished painting. My branches ended up looking more like lilac petals than cherry blossoms. I just started going nuts with the paint brush. 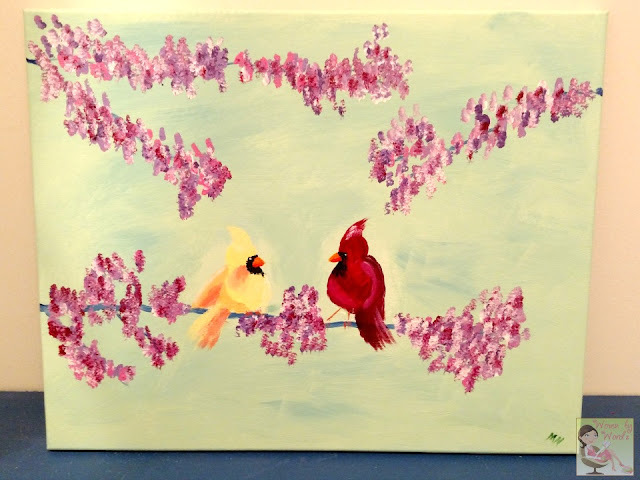 Once I realized my flowers weren't looking like cherry blossoms, I plopped my paint brush all over the place. It was a bit freeing after following all of the directions over the past couple of hours. Now I look at it and realize having gone more towards a lilac, that the flower clumps should've been a bit bunchier. I was glad to go back at the end and try to "fix" areas that I was unsatisfied with. Adding white to my female cardinal was hard because the yellow was still wet through much of the painting, and every time I tried to add white, it just became yellow again. lol In the end I was pretty happy with how it turned out. 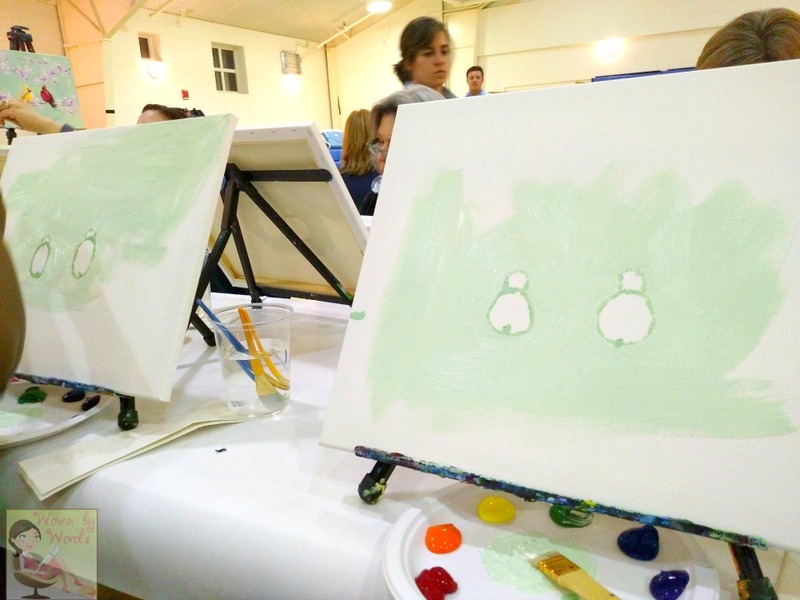 Have you ever painted with a group?